The GE Simon XT and XTi Wireless Security Systems are built for dependency, protection and with your family's safety in mind. 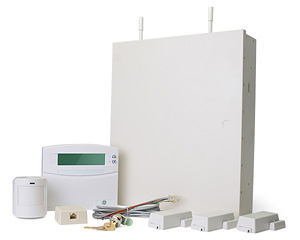 Great for homes, apartments and condominiums, these alarm kits have everything you need to keep a closer eye on your property and they are wireless (except for power and connection to a phone line if desired), so installation is fast and simple. The Simon XT and XTi kits are identical except for the keypad. 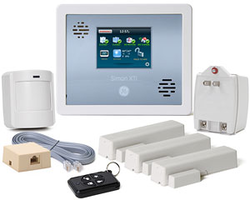 The picture is the Simon XTi Primary system with the Touchscreen keypad. Please see the docs below for the picture and specs for the LCD keypad that is included in the Simon XT Primary system. A built-in RF receiver with 96-zone capacity provides instant compatibility with the complete line of GE Security Learn Mode Wireless sensors found by clicking on the link below. You can self-monitor your alarm system or send signals through the central station of your choice. A fee will be required for an Alarm.com Interactive Gold account and/or central station monitoring. Easily add the Alarm.com Self-Monitoring and Interactive Home Automation with a GSM. Add Video Cameras with an Alarm.com account. The Concord 4 is truly a full-featured wired and wireless hybrid security system for intrusion and fire detection. (8 Hardwire zones & 96 Wireless zones) Simple to use, Concord's modular design and advanced software provide outstanding system flexibility to meet the needs of virtually any residential or commercial security application. The panel comes standard with eight hardwire zone inputs, including a 2-wire smoke detector loop that can handle up to 20 detectors. A built-in RF receiver with 96-zone capacity provides instant compatibility with the complete line of GE Security Learn Mode Wireless sensors found below. 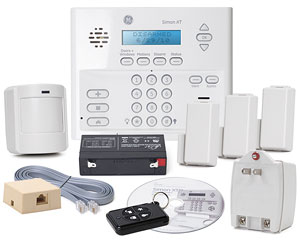 You can self-monitor your alarm system or send signals through the central station of your choice. A fee will be required for an Alarm.com account and/or central station monitoring.